In early July, several friends and I set off on a road trip to see what was out along the Arizona/ New Mexico border west of Alma New Mexico. Our route from Tucson took us to Three Way southeast of Clifton, where we picked up Highway 78, the Mule Creek Road. 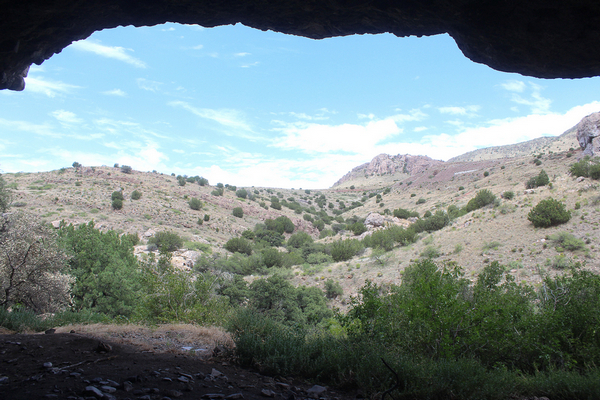 Just west of the National Forest Boundary, we parked alongside the highway and hiked down into Black Jack Canyon to check-out the shelter cave known as Black Jack Cave. The canyon and the cave are named for William "Black Jack" Christian, the leader of the "High Fives" gang of robbers who was killed in the canyon by a sheriff's posse in 1897. The gang had terrorized the residents of southeastern Arizona and western New Mexico for several years prior to this shootout. 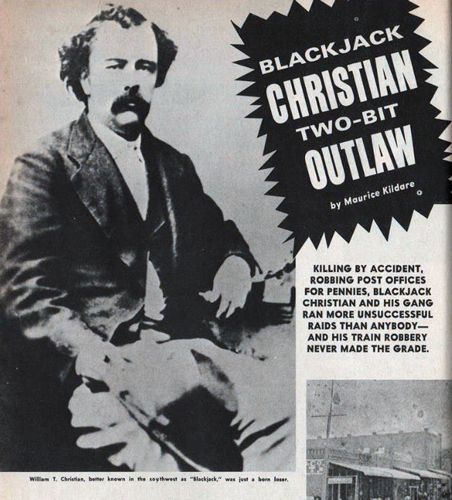 There are at least two versions to the story how Will Christian became known as "Black Jack". One version states that the name was due to Christian's bad temper or dark nature. The other version related the name to his dark skin color. Black Jack and his brother arrived in the area of southeastern Arizona/western New Mexico around 1895. While they occasionally hired out as cowboys, the Christians and their acquaintances seemed more attracted to the criminal lifestyle. Isolated stores, post offices, a couple of stage coaches, a bank and a train or two were targeted by the gang. The "High Fives", however, were apparently not very good at the robbery game. This magazine layout summarizes the history of the Black Jack criminal enterprise. Several writers have noted the history of William Black Jack Christian. What is interesting is that each author seems to have a different version of his story. There was another gang working the New Mexico area at the same time as Black Jack Christian. It was led by Tom Ketchum, who also was described as a large man with a dark complexion. At some point in time, Ketchum was mistaken for Black Jack Christian. He apparently liked the name and adopted "Black Jack" for his own use. Newspaper reporters of the 1890's did not seem to be able to differentiate between the two Black Jack gangs. Robberies commited by one of the groups were often attributed to the other. Ketchum may have received more blame/credit than he should have particularly for those bad acts that had occurred in Arizona. Ketchum initially benefitted from the shootout at Black Jack Cave. The first identification of the dead outlaw was that it was Tom Ketchum who had been killed. 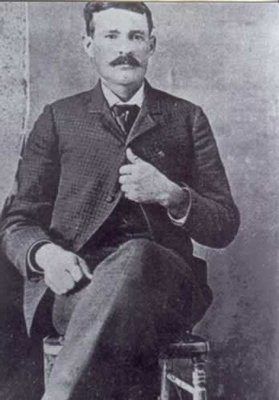 Black Jack Ketchum may have been the more successful criminal of the two, but he was eventually captured and hanged for his crimes in 1901 in Clayton New Mexico. There are a variety of accounts that describe the demise of Black Jack Christian. In April of 1897, law enforcement learned that Christian was in the Clifton area when a particularly unusual caliber of ammunition was purchased at a store in Clifton. Christian was supposed to have been the only person known to have used that caliber of weapon. Different sources reported that the rare weapon was either a 35-70, a 45-90 or 50-95 caliber. Soon after the ammunition sale, an informant notified the sheriff where Christian was hiding out. 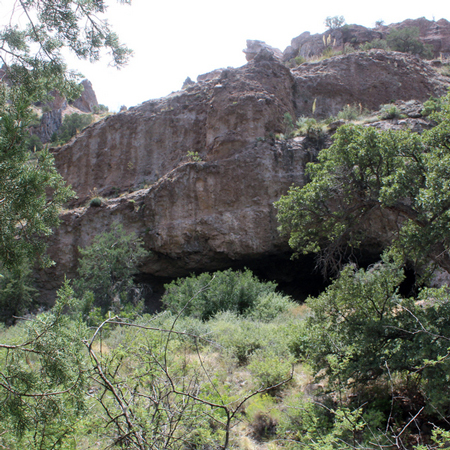 "Christian and two henchmen were hiding in a cave located in a gorge which became known as Black Jack Canyon. A five-man posse discovered their whereabouts and set an ambush. When the shooting started, Christian was hit in the side and fell out of the saddle. The lawmen retired to nearby Clifton, and Christians's companions galloped away. Later in the day the dying outlaw leader was discovered, and after he expired, his body was hauled into town atop a load of lumber." Other references describe the shooting differently. One author wrote that all of the bad guys were killed and their bodies were loaded onto horses and carried back to Clifton by the deputies and put on display. I have found the most complete description written in "Last Of The Old Time Outlaws: The George West Musgrave Story" by Karen Holliday Tanner. Musgrave was one of the founding members of the High Fives Gang. Tanner's detailed description of the shootout and other information concerning the gang can be read in this online preview. I do not remember when I first heard the Black Jack Cave story, but I have had it on my bucket list to visit the cave when in the area. The opportunity finally presented itself. For the directions to the cave, we used a "Hike Arizona.com" entry by Preston Sands. His directions were spot on. It is a very short hike from the parking area alongside Highway 78 across the mesa and down to the bottom of Black Jack Canyon. There is no trail. The terrain is somewhat rocky down the hillside into the canyon. This is the view into Black Jack canyon. There was a faint trail on the shelf above the canyon floor. Stickery catclaw was hidden in the tall grass. I did not escape this hike unscathed. This is a view up Black Jack Canyon. Rocks have been stacked along one edge of the shelf. I wondered whether they were the result of an effort to clear the shelf area for some type of farm activity? In the Black Jack Christian days, there was a goat ranch in this area. The bottom of Black Jack Canyon was scenic. There are a variety of large trees including oaks, sycamores and perhaps black walnut. Near Dunagin Spring there were small pools of water. In the Tanner book, the shoot out is described as having taken place near a spring downstream from the cave. That action may have taken place near here. The shelter cave is quite large. Mr. Sands describes it as being approximately 50' x 60' and 20' high. The ceiling is almost entirely blackened over with campfire smoke. Mounds of dirt piled outside the opening may be from the excavations for Indian relics. Whether those were legal or illegal diggings is unknown. I was somewhat surprised how the floor of the cave was not more clear of rocks and boulders than it was. It's appearance did not really give me the impression that this was a place that had been used for long term inhabitation.